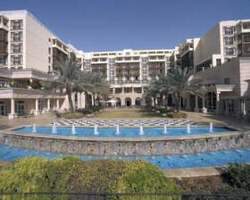 Located in the centre of Aqaba, overlooking the Red Sea, the Mövenpick Resort & Residence is a high-quality resort hotel. This architectural delight features a mix of European and Arabesque designs, with a feeling of grandeur and luxury. The resort’s 296 guest rooms include 87 suites and air-conditioned apartments, with TV, tea and coffee-making facilities, direct-dial phone/voicemail and Public Wireless LAN throughout the resort. Other features include hairdryers, minibars, 24-hour room service and safe boxes. Superior rooms and suites offer additional comforts. Non-smoking rooms are available. Rooms for the physically challenged are available on request. Business centre. the Al Nafoura Bar & Terrace in the lobby, and the Bakery Shop and Café. Meeting and conference facilities at the Mövenpick Resort & Residence Aqaba are designed to serve every need including functions, parties, meetings, seminars, lunches and dinners. In addition to the hotel’s excellent dining facilities, there are beach and poolside theme nights. Although Aqaba has an endless array of activities, the resort offers additional facilities on its own premises. These include our numerous fitness facilities to help keep you in top shape, as well as Jacuzzis installed in two locations, a sauna and a whirlpool, all available for ladies and gentlemen separately. The resort’s four swimming pools are guaranteed to keep you cool in the hot temperatures. Sindbad, our partner for water sports activities, invites you to enjoy the unique beauty and colours of the Red Sea through excursions to nearby scuba diving and snorkelling locations as well as sunset cruises and glass-bottomed boat trips. Other fun activities include para-sailing, water skiing and jet skiing. And of course we have not forgotten our younger guests. The resort’s “DANA” Children’s Activities Centre ensures a high-spirited stay for all. Children can also benefit from the convenience of their own separate pool (swimming aids are provided upon request). Desert treks to Wadi Rum, a visit to Petra and the Dead Sea can be arranged upon request. Keeping fit and staying healthy need not be boring, especially in the gym, our fully equipped fitness centre. With the latest cardiovascular and weight-resistance machines as well as a wide selection of free weights, our fitness centre has everything you will need to keep in good shape during your stay. With four swimming pools to choose from, there is no end to a day at the Mövenpick Resort & Residence Aqaba. Located under the gym, the sauna and indoor Jacuzzi provide a healthy treat for weary travellers. There are separate facilities for men and women, including changing rooms and showers.